A friend sent me a link a few weeks ago that I hadn't had the chance to share with you and I think it is very important to do it in the eve of this very important holiday for Christians which is celebrating the birth of our Lord Jesus Christ because we sometimes just say "Merry Christmas" without even knowing if the person we are saying that to is a Christian or if Christmas has a meaning to him/her or not, and so we should learn to tolerate and respect the beliefs of everybody to the point where it's possible and say "happy holidays" in case you're not sure :P.
The famous metaphor of the elephant being touched by blind men who want to define it is normally attributed to Hinduism, but is vindicated also by Jainism and by Buddhism. 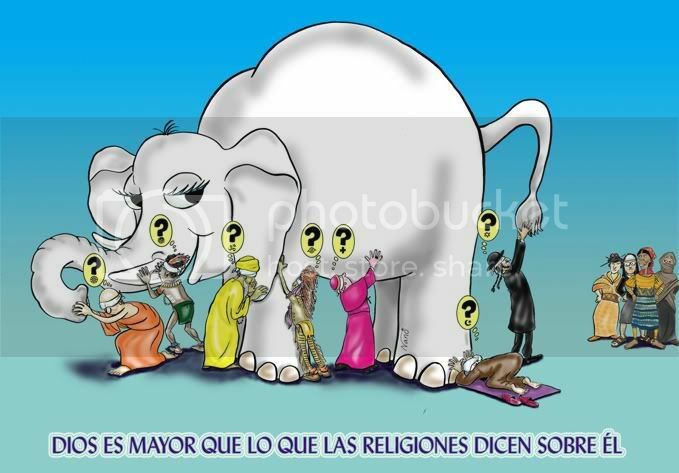 The blind men try to define the elephant with their best will, but they can't make themselves an exact idea of it. And it is useless for them to argue, because they are all right in a way. What they must do is share, to complete each other. An ideal metaphor for the inter-religious dialogue. Un amigo me envió un link hace un par de semanas que no había tenido la oportunidad de compartir con ustedes y creo que es muy importante hacerlo en la víspera de esta importante fiesta para los Cristianos que es celebrar el nacimiento de nuestro Señor Jesucristo porque a veces nosotros sólamente decimos "Feliz Navidad" sin si quiera saber si la persona a la que se lo decimos es Cristiano o si la Navidad tiene o no un signficado para él o ella, así que deberíamos aprender a tolerar y respetar las creencias de todos hasta el punto en el que sea posible y decir "felices fiestas" si no se está seguro :P.
La famosa metáfora del elefante palpado por los ciegos que quieren definirlo es atribuida normalmente al Hinduismo, pero es reivindicada también por el Jainismo y por el Budismo. Los ciegos definen al elefante con su mejor buena voluntad, pero no pueden hacerse una idea cabal de él. Y es inútil que discutan, porque todos tienen su razón. Lo que deben hacer es compartir, para complementarse. Metáfora ideal para el diálogo inter-religioso.